with the emergence and development of young easel art of Kazakhstan. The creative biography of Abylkhan Kasteev is characteristic of artists, the older generation of national republics, who did not have professional visual arts before October. He went through a difficult journey from an ordinary person, who was secretly carving, to the People’s Artist of the Republic, and the author of thematic canvases dedicated to contemporary socialist reality. The work of Abylkhan Kasteev is a unique heritage of the national culture of Kazakhstan. Serious attention is deservedly paid to him at the level of the state cultural policy, the largest in the country State Museum of Fine Arts of the Republic of Kazakhstan is named in his honor, the Kasteev House-Museum in Almaty has recently opened in Almaty, at the level of scientific and artistic activity - jubilee exhibitions international conferences, the Institute of Literature and Art. Mukhtar Auezov published books and written articles about his work. We all understand that for Kazakhstan and the Kazakh culture careful and steady attention to the heritage of Abylkhan Kasteev is a matter of national honor and pride. Abylkhan Kasteev is the first professional Kazakh artist who used oil painting on canvas, in watercolor. He is undoubtedly a pioneer, a pioneer in new for the Kazakh culture types of art. For all of us - the heirs of the cultural wealth left by Kasteev - it is important that he became the first Kazakh to reflect the contemporary Kazakh culture in his work - the traditional nomadic life, images of contemporaries, transformations and changes that came to the steppe. The first serious experiments of Abylkhan Kasteev in the visual arts belong to the thirtieth of the twentieth century. In the same period, such talented Kazakh artists began to work. Why, while highly appreciating and recognizing their merits, in the art history of Kazakhstan, it was precisely Abylkhan Kasteev who established the role and place of the main founder of the professional fine arts of Kazakhstan? Why is it so obvious to his work that such a deep interest is not only among art historians, among the broad cultural community and among artists of Kazakhstan of all subsequent generations? Why, recognizing or denying this or that phenomenon in art, or even how often it happens in recent years, denying everything, our critics and artists are always unanimous in their positive perception and respect for the works of Abylkhan Kasteev? The richest work of a remarkable artist, his life, unconditionally and devotedly devoted to art, give every reason to try to understand and objectively formulate, thanks to what factors Abylkhan Kasteyev is considered the first professional Kazakh artist and founder of the national art school of Kazakhstan. Characteristic of that historical period is the biography of Abylkhan Kasteev. It is subtly intertwined with chance and regularity, it would seem, quite accidentally, but his extraordinary artistic gift leads him, albeit in twisting ways, but still decisively and truly to his successful creative destiny. Born in 1904 in the town of Chizhin near Jarkent, the artist was left without a father early. At the age of 8, he already helps the family, working as a shepherd with a wealthy fellow villager. Spending long hours alone with the beautiful nature of southern Kazakhstan, absorbing the magnificence of its rivers and mountains, valleys and hills, A.Kasteyev from his childhood begins to comprehend its greatness, strength and primeval beauty. Even then, the artist’s natural gift begins to cut through. Like his ancient ancestors, who created the unique graphic complexes Tamgaly, Mangystau and Irtysh, the young Kasteev paints on stones. The first, but still not preserved, yet half-child samples of Kasteev's creativity are his compositions on the materials of the boy's best henchmen - stone, bark, woodcarving. He carved a capable shepherd and a Kazakh ornament, depicted what surrounded and was so close and dear - gentle hills and rounded domes of yurts, silhouettes of trees grazing sheep. Gifted by nature to the rare gift of artistic creativity, the teenager at first did not find a direct response among his close circle. The aul old men sometimes even condemned his 'sinful activities', but the future artist did not agree with them, defending himself, he put forward a comparison of his drawings with the singing of the akyn. Appeared such a noticeable gift a generation earlier, it could turn into traditional crafts or even fade away altogether, but Abylkhan Kasteev’s artistic talent was destined to unfold in all its glory. The time of drastic changes dictated changes and changes in the life of everyone, and even in such an aul as distant from the social cataclysms of the era like the then Chizhin. Perhaps it is now considered to be a good tone to condemn the achievements of the Soviet period in the history of our country, but speaking fairly, it is certainly necessary to recognize that this sharp social cycle had its positive sides and its results. After all, thanks to new social attitudes, many people endowed with artistic, actor, music and other talents, people from the people, have wide opportunities for their own realization, moreover active participation in the creation of national schools and new types of art. The culture of Kazakhstan of those years was dominated by an atmosphere of creation, the energy of creative enthusiasm beat the key. At the new art scene of the most strata of national life were put forward such brilliant talents as Amre Kashaubaev, conquered his art discerning Parisian audience, the famous singer - Kazakh nightingale Kuliash Baiseitova, great dancer Shara Zhienkulova actor Kalybek Kuanyshbayev, actor, playwright, director Kanabek Baiseitov many others. It was truly a golden pleiad of pioneers of Kazakh culture, a time inspired by the ideal utopian dream, creativity filled with immense joyful inspiration. All the participants in this creative development have rightfully become the pioneers of art, each in their own field of creative activity. Already by a single listing of their names, one can judge about the innumerable and rich potential of the cultural resources of the nation, which joined the creative life of Kazakhstan in the twentieth and thirtieth of the twentieth century. The activation of cultural resources took place in the scale of the cultural society of the republic. In the eyes of one generation, new cultural institutions were being created, a new cultural stratum of Kazakh society was emerging, new and previously unknown areas of creative expression were being formed and professionally growing. Studios and musical theaters were created, which later became the best and most famous scenes of the country (in 1926 the first national Kazakh theater opened, headed by Zhumat Shanin, in 1934 the musical theater, now the State Academic Opera and Ballet Theater named after Abai, was opened the same year, the Kurmangazy Orchestra, under the direction of Akhmet Zhubanov, was created, creative unions arose, art galleries opened. Until now, rare musical recordings, unique memories of contemporaries, preserved paintings and drawings convey to us the amazing charm of this time. The period of pioneers and discoverers, covered by special enthusiasm and hot patriotic feelings, because everything that was done and what moved them forward, was primarily devoted to the native people, and as if by magic, it immediately became an immortal contribution to the national culture. Also unexpectedly and, it seems, sometimes it’s really just magical, the fate of the young shepherd Abylkhan is also emerging from the beautiful because of its nature and traditional culture, but far from the new social paths of the Kazakh aul. Born in a small calm aul that had been living for centuries in the manner commanded by ancestors, the future people's artist of the Soviet Union, Abylkhan, was only in 1925, when he was already a 21-year-old young man who first took a pencil in his hands. At the same time, he still paints in secret, still fearing the condemnation of the local clergy and relatives. But soon, having felt the inward feeling of drawing to the inner sense, he realizes that he will no longer recede from this occupation, realizes that drawing is his life calling. Before firmly linking his life with art, the young Kasteyev had to walk along unknown paths in order to go on his direct path to the profession of an artist, he tried various activities and activities. In 1926, Abylkhan, for the first time, left his native village for Zharkent, the current Panfilov, where he works as a laborer, but devotes all his free time to drawing, for the first time tries to paint with oil paints. A completely different life begins to boil around him, there are new and different people, different nationalities and types, characters and habits of life, and now their faces next to the faces of their relatives and fellow villagers gradually appear in the careful sketches of the artist who is attentive to the life. The power of his gift turns out to be so great that, even though he doesn’t have much idea of ​​the reality of the profession and creative activity of the artist, young Abylkhan intuitively, but already firmly connects his vital interests and aspirations with fine arts. He seems to draw everything that he sees and how he can, as he feels, with little or no knowledge of professional literacy or the opportunity to learn. The natural sense of color and scale, the ability to sense and convey a figure and objects in space, even the organically inherent need for a wide compositional scope distinguishes these almost the earliest serious works of the artist. Being sensitive and careful to the beauty of traditional Kazakh life, he with love and meticulousness conveys the color structure of tekemets and alash, tuskizas and baskures that adorn the interiors of the yurt, where Kazakh craftswomen work. Most often, he depicts his sisters or relatives, the features of their people, concentrated with touching care, transferred by the artist, often draw attention to themselves by their similarity to the author of these portraits himself. In different destinies of people one noticeable feature often appears. Almost always, the life presenting its surprises prefers to bestow with its favor those who show loyalty to themselves, those who even unconsciously, but nevertheless, unswervingly follow the path destined to him. Those who unconsciously but faithfully believe in their calling. So with Kasteev, at times, it seems that someone from above leads a young, talented self-taught person to a surprisingly predetermined role and an important place in the visual arts of his native country. In 1927, construction of the most important object of those years, the Turksib railway, was launched in Kazakhstan. A new reality and the opportunity to get new impressions attract the attention of the future artist, and in 1928 he is sent to work on this famous construction site thundering with his work glory. It must be said that Kasteev’s desire to expand his horizons is not limited to drawing. Having settled in as a simple excavator on the construction of the railway, in 1928 the future artist graduated from an evening school for adults. Of course, the circle of his acquaintances, of life impressions is expanding dramatically and his talent and craving for drawing cannot go unnoticed by the people around him. Attentive friends and new acquaintances cannot pass by such a noticeable gift with indifference. Having listened to the advice of new friends, who seemed to have guessed his inner purpose, Kasteev went to Almaty and started studying at the private art studio of Khludov. The private art school of Nikolai Khludov, which opened in 1920, gradually became the center of attraction for many young talents in the region. Creativity of Khludov, due to which Kazakhstan has become a real source of inspiration and a constant theme of his art, occupies a special place in the history of national art. From the moment of his arrival in the city of Verny as a draftsman of the boundary department of the Semirechensky regional government, for many years and thanks to his work in various government posts related to traveling around the region, Khludov was able to see, learn and love the nature of Kazakhstan and the Kazakh people. 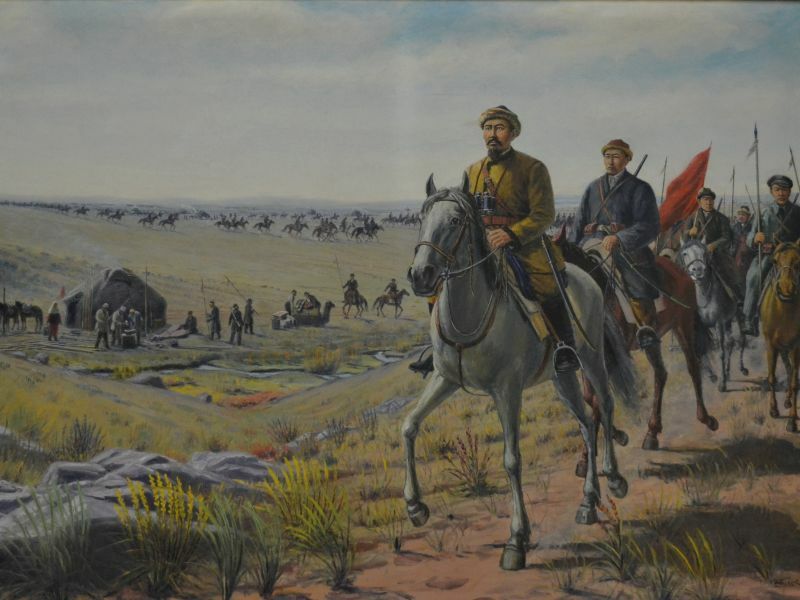 The influence and even the influence exerted by Nikolai Khludov on the work of his direct students, with which, of course, can be called those who studied at a private school and studio of future artists and the indirect influence that they had on the whole on realistic priorities and trajectories of the fine arts movement in Kazakhstan of the period formations and formations became strategic in their own way and for many years predetermined its paths. The lessons of realism imparted by Khludov, attention to the ethnographic richness of the culture of the Kazakh people, the views of their favorite mountain peaks and densely wooded landscapes of the Ili Alatau can be found in the landscapes and genre paintings of almost all generations of artists of Kazakhstan. Echoes with love of the composite techniques developed by him in depicting Kazakh nature, mountain steeper and foothill villages, zhailau and steppe landscapes are firmly preserved as a kind of basic basis of motifs and techniques in painting in Kazakhstan.